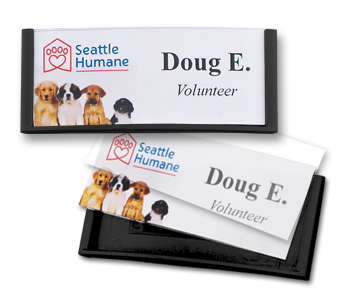 Speedy Badges are printable custom name tags that are great solutions for companies with positions that experience high turnover rates and for volunteers. These inexpensive and easy-to-use plastic badges are simple to assemble and come with a colored frame and a clear plastic lens. Each frame features a gentle forward curve that accents the style and classiness of this badge choice. 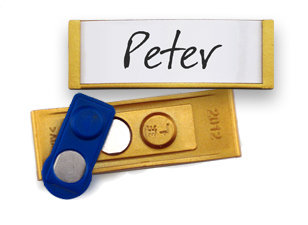 These window style badges are available in three colors: black, gold or silver. 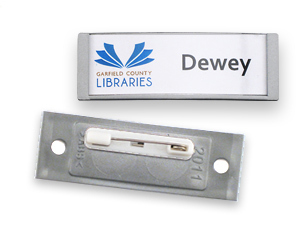 Reusable name badges can be used over and over again by removing the used insert from the badge and adding a new printed or written paper insert. Purchase perforated insert sheets separately; printing templates are also available. Quantity Discounts: We offer generous price discounts on quantity purchases; see individual order pages for more information. Fast, friendly service: Professional customer service representatives will quickly process your order and are available to answer any questions. Save time and money with reusable badges. With plenty of room for your information these quality plastic window badges are the perfect solution for short term name badge use. Each badge measures 1.25x x 3.125 inches. Inserts and templates for printing them are also available. 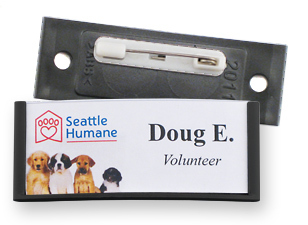 Small name badges are light weight and easy to wear. There is still plenty of room to add a name that is easy to see. Each badge measures 0875 x 2.625 inches. Inserts and templates for printing them are also available. 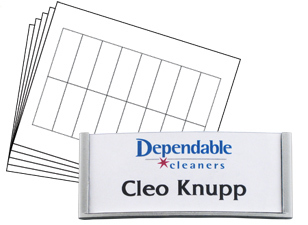 Name Tag, Inc. carries a wide selection of reusable name badges. If you don't see what you want give us a call and we'll help you find it. Large selection – Low prices! 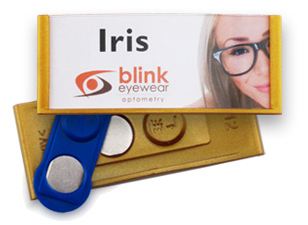 PRICE INCLUDES: One Speedy Badge with a pin or magnetic fastener and clear plastic lens. Inserts are sold separately. Paper inserts for Speedy Badges may be printed using your ink jet or laser printer. The inserts are sold in a package of 10 sheets of perforated 67 pound card stock. Templates to assist in printing are available. PRICE INCLUDES: One package with 10 sheets of perforated card stock. 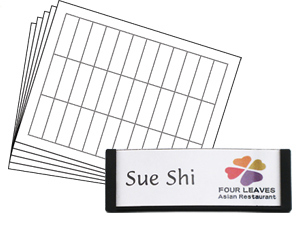 Name Tag, Inc. offers several generic templates to help you print your inserts. These templates can be used in Microsoft® Word or OpenOffice™. DUE TO THE NUMBER OF VARIABLES IN HOW YOU MIGHT HAVE YOUR DOCUMENT SOFTWARE CONFIGURED, WE DO NOT OFFER TECHNICAL SUPPORT FOR THESE TEMPLATES. All templates have been set up using Microsoft® Word. Adjustments might be needed when using another software program.